Summary: I began this walk from the car park near to the Old Dungeon Ghyll Pub in Great Langdale. It was a thrill throughout with the terrain constantly changing as I walked, each change bringing about its own adventures. 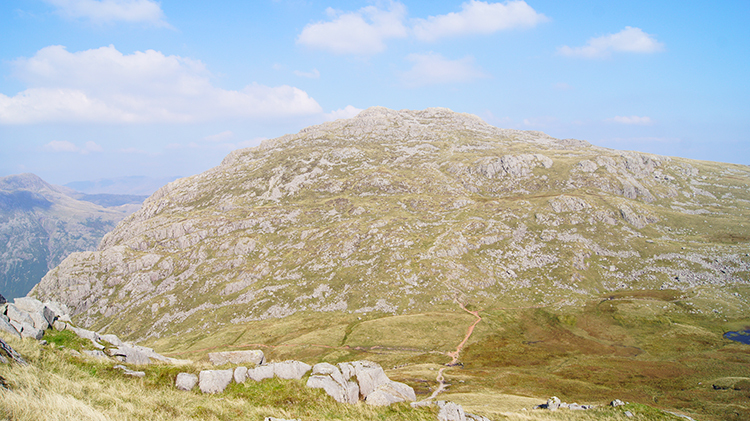 First off I climbed steeply along the broad shoulder of the Band to pass White Stones and cross Earing Crag to reach a junction of paths from where I took the right hand one to follow the steep Climbers Traverse path which clings on to the northeast shoulder of Bowfell. 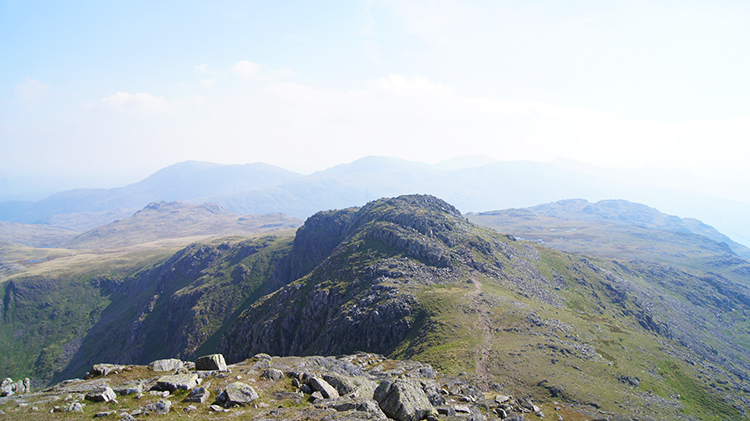 After that thrill came another while I climbed up to Bowfell along the west edge of the Great Slab. Having climbed to my highest point of the walk on Bowfell I took a breather before enjoying the roller coaster walk over the Crinkle Crag rock lands. Then I enjoyed a complete change of a walk over light brown upland grass plains to Cold Pike before enjoying a steep sweep down and steep climb up to the summit of Pike of Blisco. After all the fun I edged down to Oxendale and back to Old Dungeon Ghyll. The Walk: While out on a walk with my Red Rose friends Neil and John I had been talking about my first Crinkle Crags and Bowfell walk. I was telling them of the fun I had climbing over all the Crinkles, of my scramble over the Bad Step and of my joy standing on top of the Great Slab. "You will have to do it again, only this time by the Climber's Traverse" said Neil. 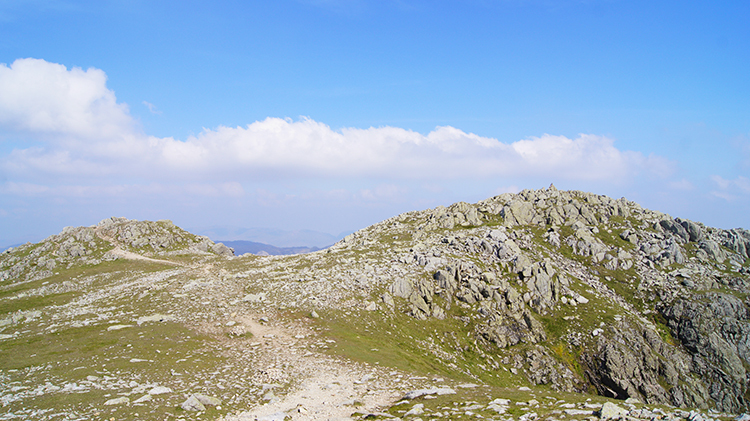 He went on to say while not a ridge the path was a narrow one, high and exposed as it weaved its way along the edge of Bowfells northern crags. "It will charge you up for the rest of the day" he added. And so with his thoughts in mind this walk was born. I even added Cold Pike and Pike of Blisco which I had wanted to climb for ages. The scene was set. It was the last of an epic four days in the Lake District and after climbing Great Gable on the first day, the Scafells on the second and the highest Coniston mountains on the third day this was a fitting finale. 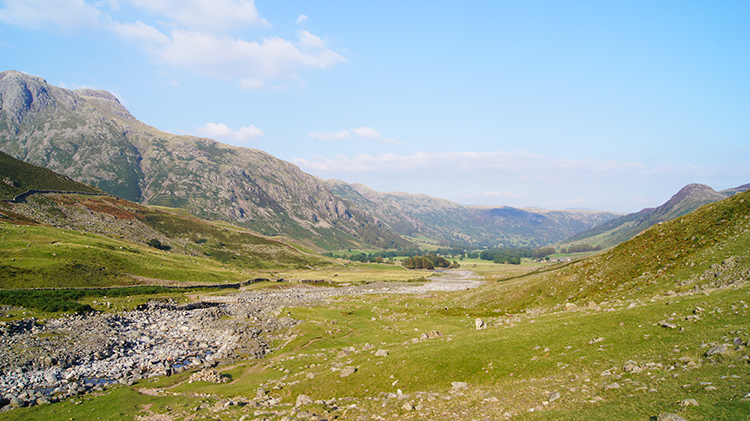 I arrived in Great Langdale in mid morning and set off walking just before 10.00am. Early morning cloud was lifting as I walked past the Dungeon Ghyll pub and along the road to Stool End Farm. 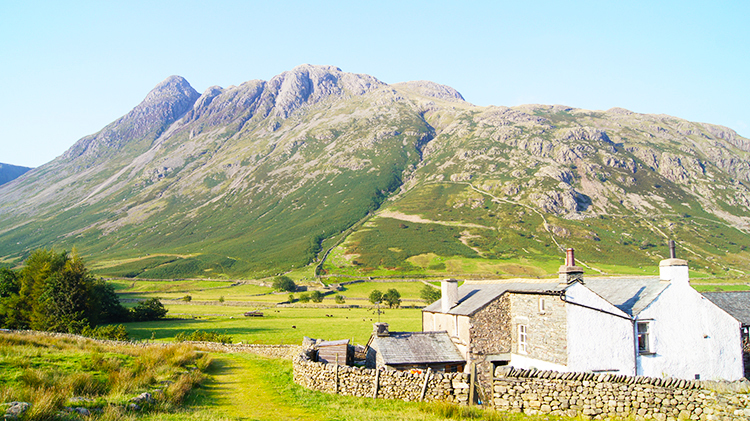 At the farm I reached the start of my long climb of 800 metres height gain to Bowfell. The path along the Band was set out before me. As I set off along the Band I stopped another walker wearing a hat about 200 metres ahead of me. 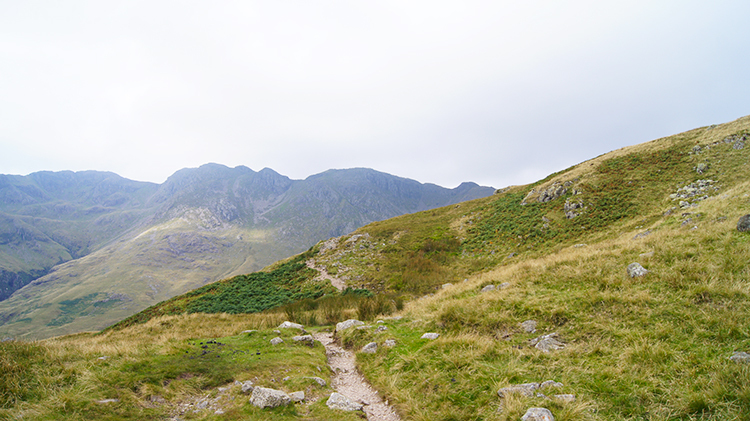 He rounded a crag on the high path ahead and disappeared from view as I looked upwards and set off on my way. After the three days of Lakeland walks I had just done my batteries were fully charged and I powered my way up the path, only stopping to look in awe at the breathtaking views of Great Langdale which were set out before me to my right. I soon caught the walker who had set off up the Band before me. He was stockier than me and climbing in a leisurely ramble style. I stopped for a brief chat with him when we met up, during which we agreed on the luck we had to be up on these fells on such a good and relatively quiet day. Then I bade him a good day and powered on my way further up the Band, beyond White Stones and on to the easing gradient at Earing Crag. The views of near and far mountains were beginning to stagger me, the picture made enigmatic by sweeping lines of dark and light caused by the clouds scurrying across the sky from south west to north east. Blue sky was making more of a show between the clouds, the sun was winning. 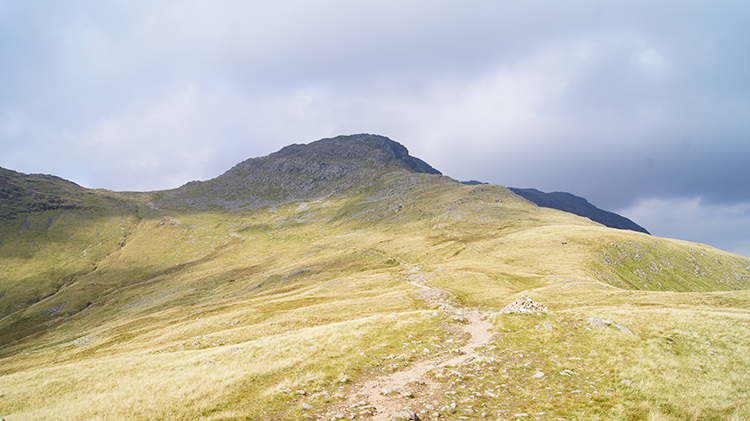 After the walk on the Band past Earing Crag I spotted the col between Crinkle Crags and Bowfell. "I need to cut off to the right soon" was the thought in my minds eye. The Climbers Traverse was hidden over the lip of a ridge to my right. Just before I reached the col a rocky path over the tip of the ridge to my right led me to it. "Wow, this looks exciting" was my immediate thought on first sight of the narrow weaving path set out before me. "I am going to have fun on here" was my next. And I was right. Climbers Traverse did not disappoint me at all. 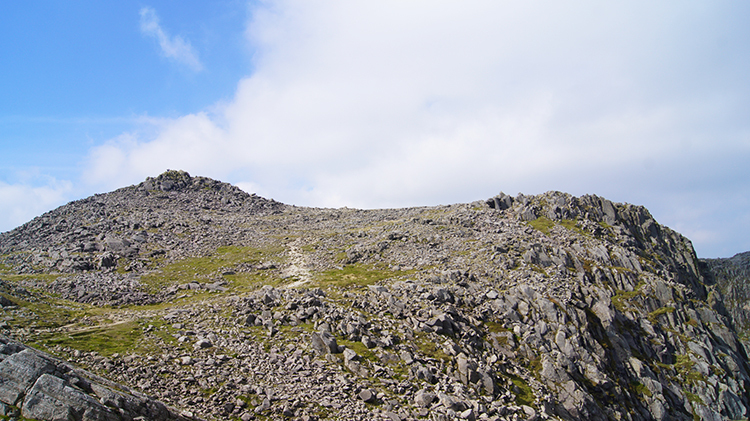 The traverse was sideways rather than up or down while cutting across across the steeper gradient of the face of Bowfell. Imagine a path clinging onto the edge of the mountain while all around is slipping down. That's it. At one moment I would be edging around a protruding jutting out cliff and the next I would be shuffling across a scree slope trying to stay on the highest part of the landfall. The next I would be walking by putting one foot in front of the other as the path was only one boot wide. It was great fun. 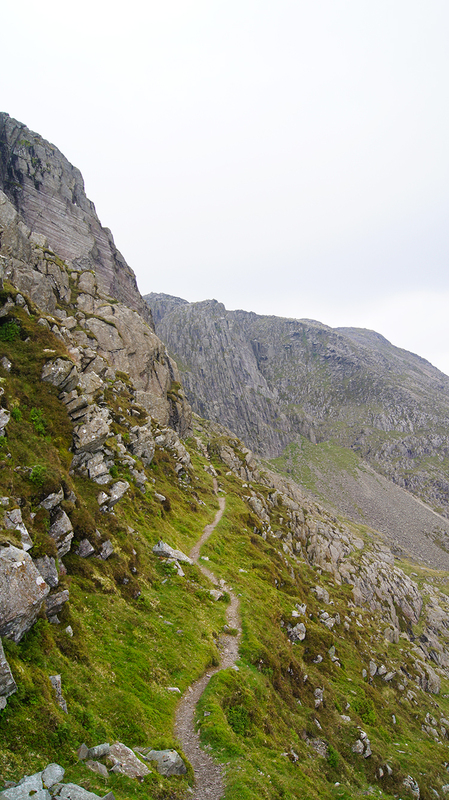 And all the while I had fixed my eyes on the rocky masses of Cambridge Crag, North Buttress and Bowfell Buttress which are the objectives of the climbers after who the Climbers Traverse is named. Ascending by their means of access to the summit of Bowfell was not for me though, I do not have the head for climbing up steep rock faces with ropes as my lifeline. I would be scrambling on all fours up the side of a slab instead. The slab in question is the 'Great Slab'. It is aptly named, a huge and quite remarkable tilted sheet of rock set at an angle and embedded into the north east face of the mountain. To get to the bottom of the slab I first had to complete my walk along the Climbers Traverse which ended by crossing a field of scree. That done I was standing with the awesome rising rock face of Cambridge Crag full in my eyes. To my left was the Great Slab, rising like a leaning table top up the mountain. I got to below the north side of the Great Slab and scrambled on hands and feet up the natural gully formed between the Great Slab and Cambridge Crag. It was quite exhilarating. As I looked up, wiping the sweat running from my forehead into my eyes as I did so, I noticed bright blue sky beckoning me upwards. I continued climbing on hands and feet, eager to touch the sky. It had been so exciting crossing the Climbers Traverse and scrambling up between slab and crag. 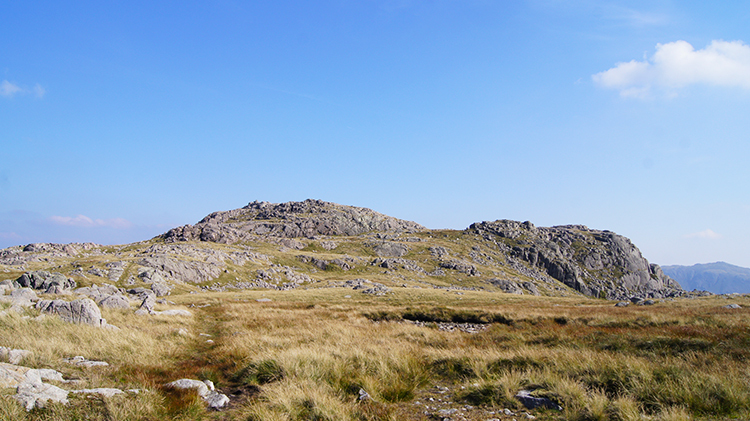 So much so that I reached the top of the Great Slab and near to the summit of Bowfell without really noticing. That is the way to climb mountains. 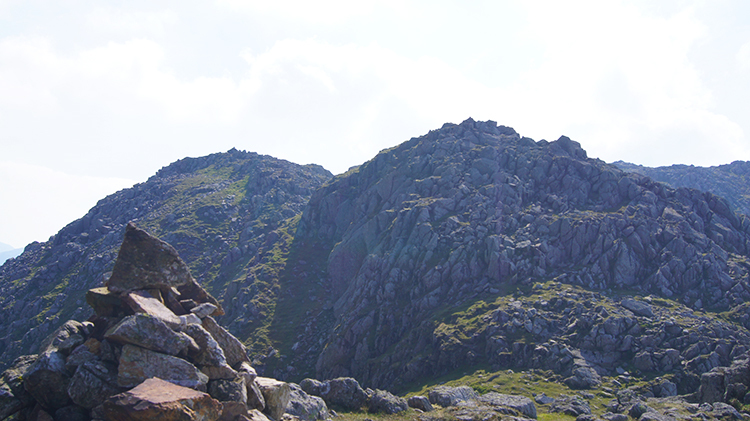 Standing upright with ease for the first time in a while I looked up to the shattered pyramidal peak of Bowfell, a summit land of eroded rocks which Wainwright referred to as a giant cairn. 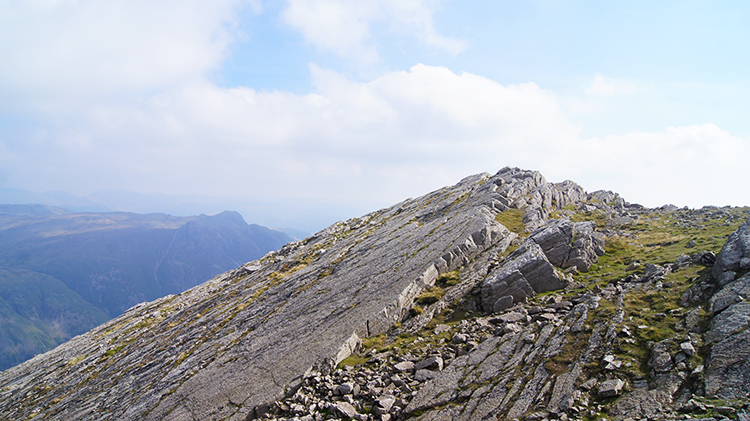 I clambered up the natural cairn and found myself quite alone at the top which was a bonus. 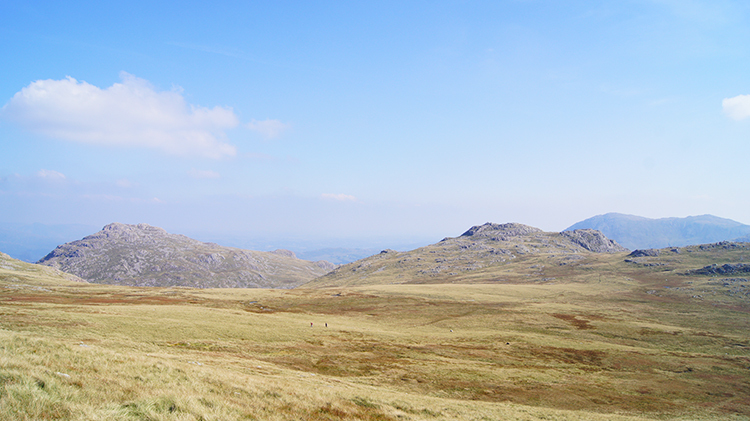 As I stood on the summit of Bowfell I saw scattered groups of walkers approaching from the col path. I turned from them and found a good spot to sit for a while which gave me a fantastic view west and northwest to Scafell, Scafell Pike and Ill Bell. 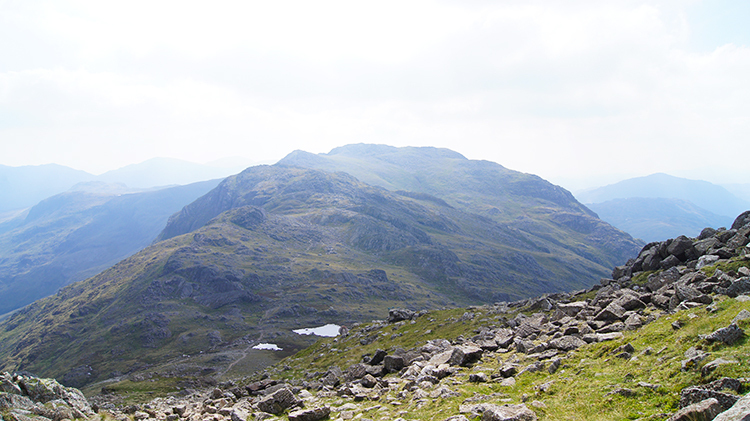 In fact the view from the summit of Bowfell is one of the most spectacular in all of the Lake District. If I had fixed my eyes sharp enough I would have seen as far as Cross Fell in the North Pennines. Closer in view the mountains to spot and identify starting north and going clockwise included Skiddaw, Blencathra, Clough Head and the Dodds, Helvellyn, Nethermost Pike, Dollywaggon Pike, St Sunday Crag, Fairfield, Kidsty Pike, High Street, Harter Fell, Wansdale and the Old Man of Coniston. Windermere could be seen too as could all the mountains I had targeted for later today. I drunk the views in as much as I could while having a short refreshment break before standing up and setting off on my way. As I left the summit of Bowfell others arrived. I walked carefully off the wavy sea of jagged rocks on the top of the mountain and then once I had reached the firm even ground of the access paths I fair bounded down to the stepped section of path leading to the col. As I hopped down the steps of Bowfell Links in a gusto of delight I greeted fellow walkers hauling themselves up to that enjoyable view. Perhaps some had no wanted to speak but all made the effort to. 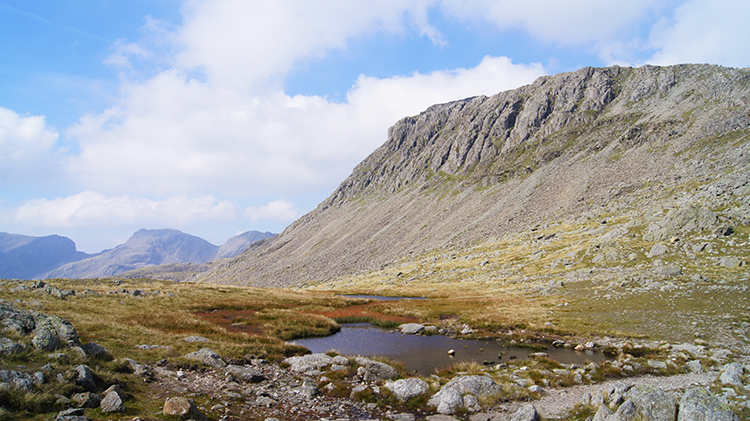 Further down the path I caught sight of the Three Tarns which sit in the col. Beyond the tarns the Crinkle Crags were set in line before me. When I had looked down on them from the summit of Bowfell they had looked innocent. Now they looked quite a challenge. I got down to the Three Tarns and paused to look across the impressive southwest flank of Bowfell before taking the challenge on. 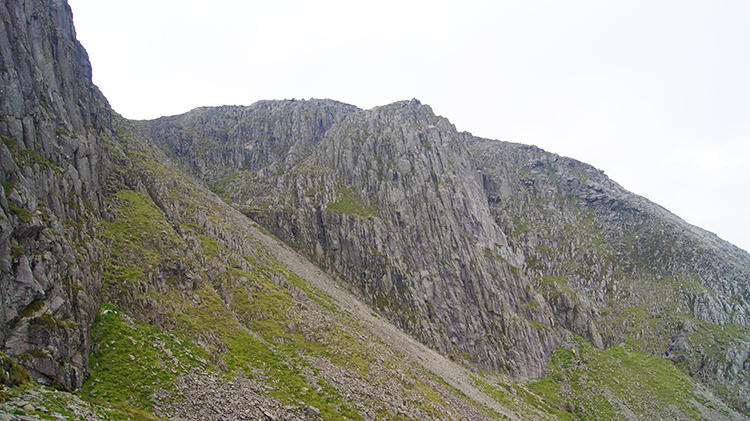 The Crinkle Crags are a series of steep buttresses. Individual cathedrals of stone in their own right, set in a line as a band of brothers. I set out to walk across them all from north to south. 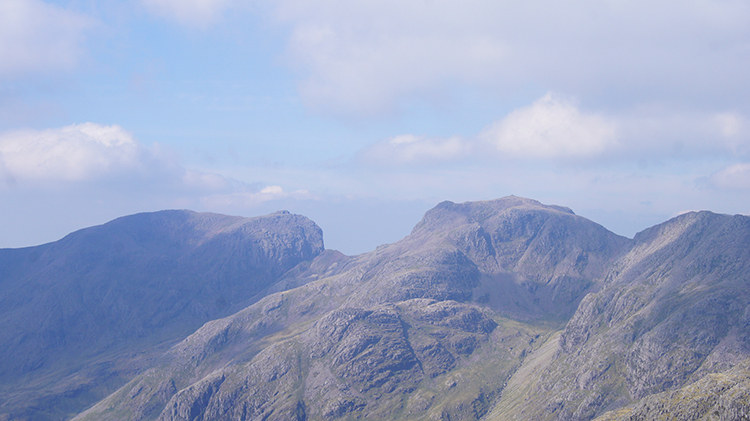 Wainwright had said of them "Crinkle Crags is much too good to be missed. For the mountaineer who prefers his mountains rough, who likes to see steep craggy slopes towering before him in the sky, who enjoys an up and down ridge walk full of interesting nooks and corners, who has an appreciative eye for magnificent views, this is a climb deserving of high priority". How could I turn an invitation like that down. Off I went straight across the first one, clambering over the rocks as best I could by choosing a promising route. Paths lead up to the cathedrals but sometimes are lost in the mess of rock. Sometimes I took the wrong route and found myself staring over an abyss, turning back to find the path successfully after a series of trials and errors. It was never intimidating, it was always fun. Pausing while clambering over one of the crinkles and looking over my personal scene was always evocative. 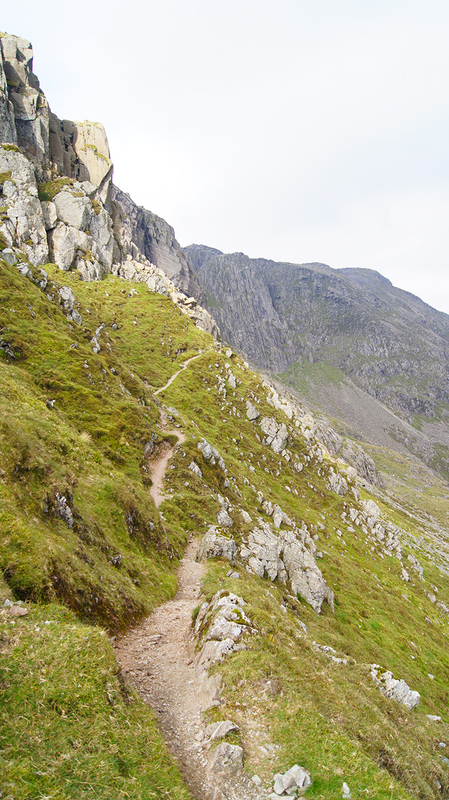 The scenes before me changed with every few steps as another quirk of a particular Crinkle Crag revealed itself. As it had been on the Climbers Traverse and as it had been on the scramble up alongside the Great Slab I was in rapture again. Again I refer to Wainwright who said "The ridge is a fell-walkers delight. constantly changing scene, beautiful and dramatic views, fine situations and an interesting course throughout make this a walk to remember". I would say so. However I would emphasise the interesting course is of ones own making. 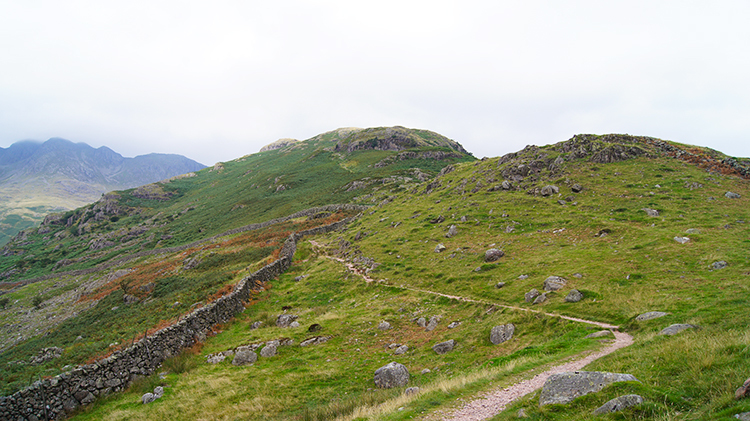 While I was crossing Crinkle Crags so were other walkers and often walking in the opposite direction. When on the paths between the crinkles the walkers met and greeted each other in words. When crossing the Crinkles they often did not, being in completely different places on the rock giants and this greeting each other in hand waves. More than once I heard the shout "Where is the path on that side?". 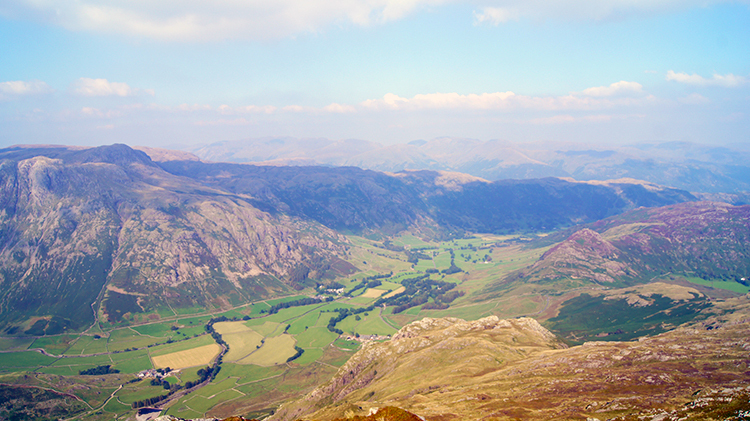 The views to other mountains from Crinkle Crags were lovely if not pin clear. As the day had progressed the sun had begun to dominate the sky and while it was late September there was still some heat haze permeating. Still I could see the Langdale Pikes in the near distance to the northeast and the Coniston Fells in the near distance to the southeast. 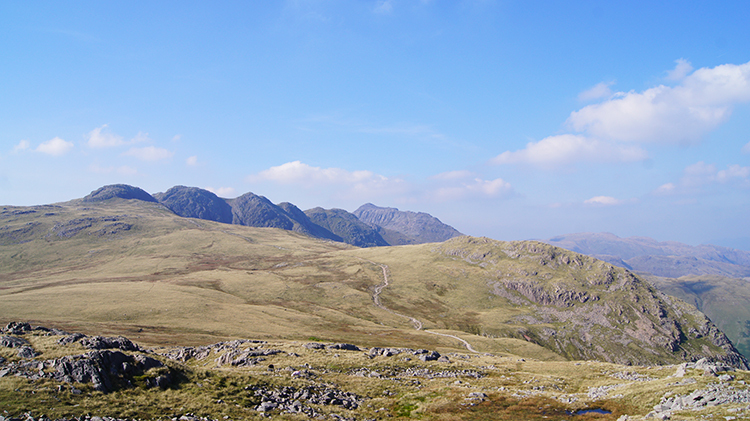 I looked a little enviously at the Old Man of Coniston shimmering in hot sunshine. Twenty four hours earlier I had been with him and his companion mountains stuck in a swathe of low cloud. Today I was more fortunate though, enjoying the mountains of Lakeland in the best of conditions and in relative solitude. Thanking my luck I continued my adventure crossing Crinkle Crags. I reached the highest of the Crinkle Crags, known numerically as the second crinkle and in my case the second last as they are numbered going from south to north. 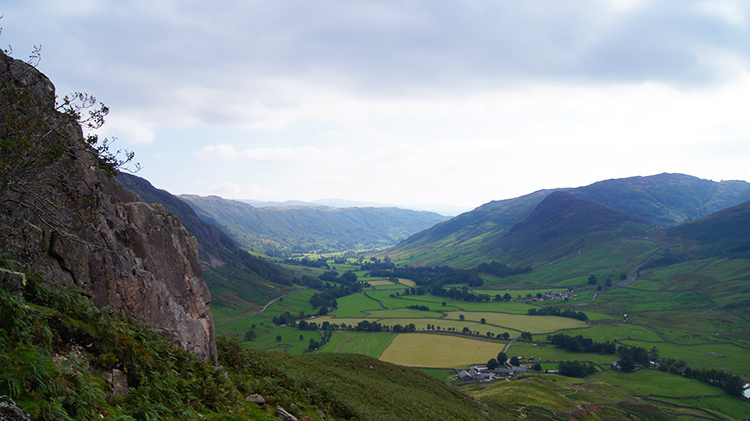 The second Crinkle Crag is best known for two reasons. Not only is it the highest at 859 metres but it is also the one where Bad Step is found. 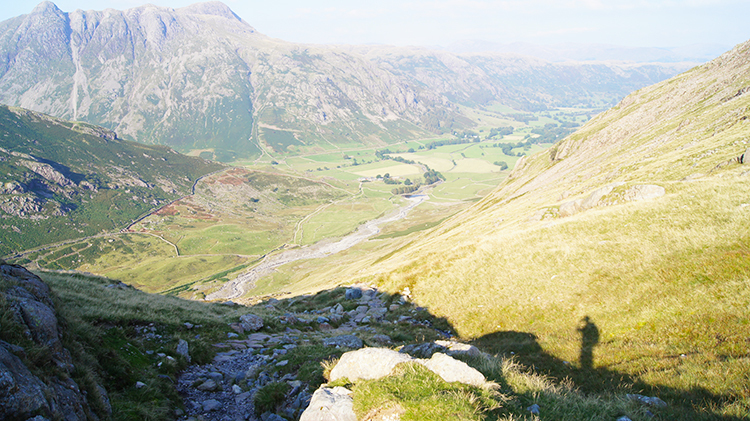 I had scrambled up the Bad Step on my first crossing of Crinkle Crags and wanted to scramble down it this time. Only this time I had a problem. The first was finding it. I could see it when walking towards it on the path from the south but I had no idea where it was while crossing the rocky top with no path to lead me in. Twice I came to places where I tried to scramble down but could not do so. Then luckily I saw a walker heading in from the south and I crossed the top of the Crinkle keeping an eye on him as much as I could. With his oblivious help I found the semblance of a path and came to the top of the Bad Step. I tried shimmying down a couple of times but no being able to feel the ground I gave up, deeming it a risk of injury if I took the plunge. I gave up and scrambled around. I concluded that the Bad Step is hard to climb up but it is possible to do so. Coming down it is much more of a risk as the descent is carried out blind. For me it was anyway. Afterwards I looked back and watched another walker scramble up in an undignified manner. 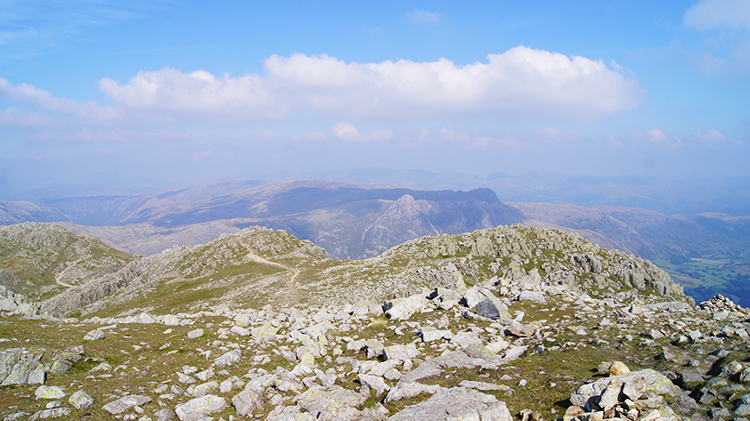 Then I continued on my way and up across the final Crinkle Crag which had a cairn on its summit. 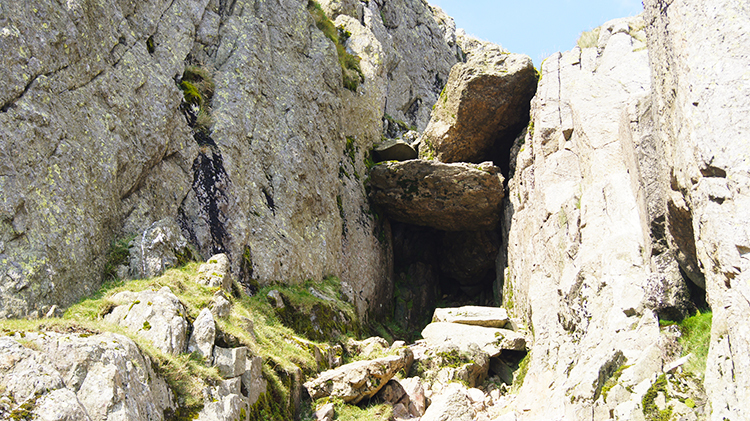 (Note: Bad Step can be avoided by walker around the second Crinkle Crag but where is the fun in that). 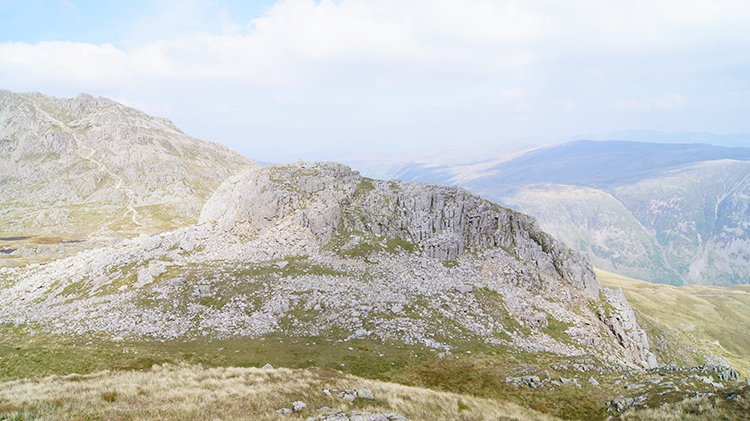 I left Crinkle Crags behind and started a much different phase of the walk. From a walk of crags, buttresses and rock tors I left rock completely behind and reached a prairie of light brown grasses. It was an amazing contrast. I could see my objectives beyond the expanse of grass, Cold Pike and Pike of Blisco rising like isolated islands in the sea of grass. The prairie looked so inviting and I wanted to run as fast as I could across it. 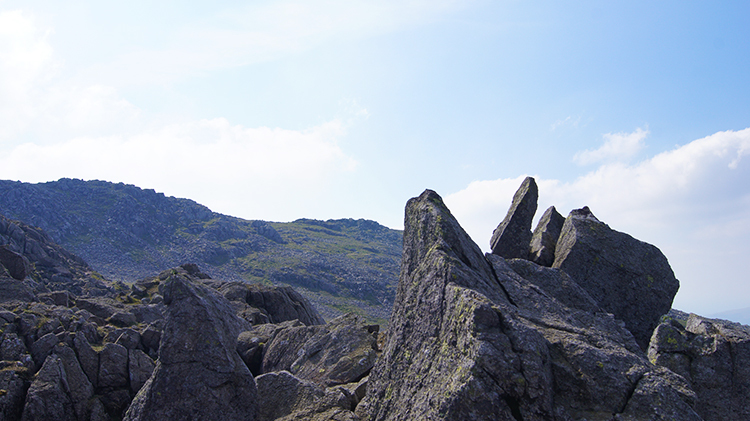 I was so invigorated from the thrills of Bowfell and Crinkle Crags that it seemed possible to do so. But the brown prairie was deceiving. Not long after beginning the crossing I felt the squelch of water under my feet. Bogs hid beneath the inviting grasses and only the darker browns revealed where they were more prevalent. So instead of bounding across the big grassland with a spring in my step I meandered across keeping to the lighter grassed sections as much as possible. I reached Cold Pike with my boots wet for the first time in the day. What I had first imagined as an easy stroll across a grassland had been akin to a walk stepping on a sponge. I never sunk in below my boots though, it was not that bad. Not nearly as bad as my native Yorkshire Dales and Pennine Moors boglands! (Oh, I love it really). Back on the firm ground of Cold Pike which is in reality a piddle of a climb from my approach I clambered up to the top of the highest of its triple peaks in no time at all and took a break. While I did so I looked across to Pike of Blisco, my final mountain of the walk. I also looked west and north. to Crinkle Crags and to the path leading up to them from Great Knott, the path I had first walked on my epic walk of 2005 when I first fell for Crinkle Crags and Bowfell. 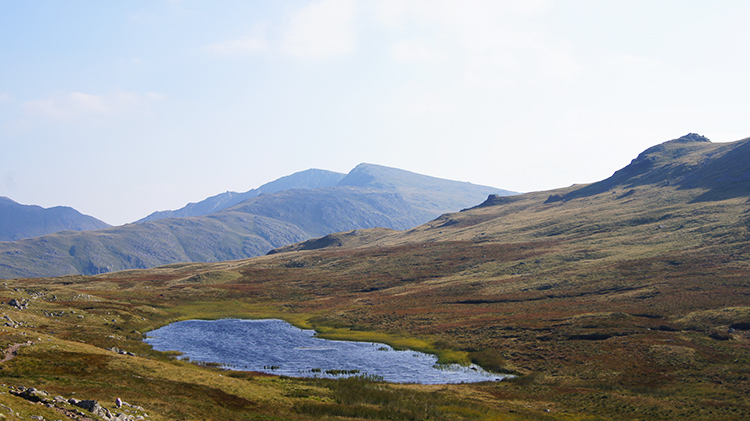 It was a gorgeous afternoon as I scrambled down from Cold Pike to Red Tarn and as a consequence my climb up the 170 metres from the tarn to the summit of Pike of Blisco was a hot and sweaty one. 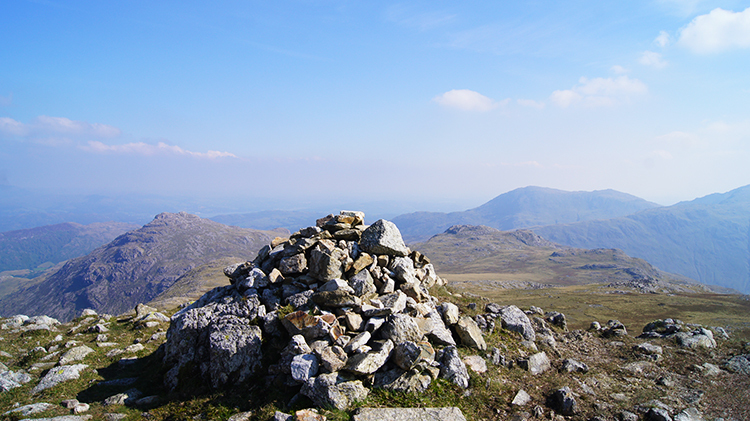 It was nearing the autumnal equinox and I was still in a t-shirt at over 700 metres when I reached the summit cairn of Pike of Blisco. It was past 4.00pm and still warm with hardly a breeze in the air. I settled down for a short final break in my walk and after resting stood up beside the cairn to look around me near and far Looking down from Pike of Blisco to Great Langdale I set my eyes to focus on a glorious scene. It looked so still and lifeless, a perfect picture. Side Pike which guards the road leading from the Great Langdale to Blea Tarn and linking to Little Langdale looked like a pimple from up here, not anything like its 310 metre height it looks from the valley bottom. My climbs were done for the walk, only downhill followed. 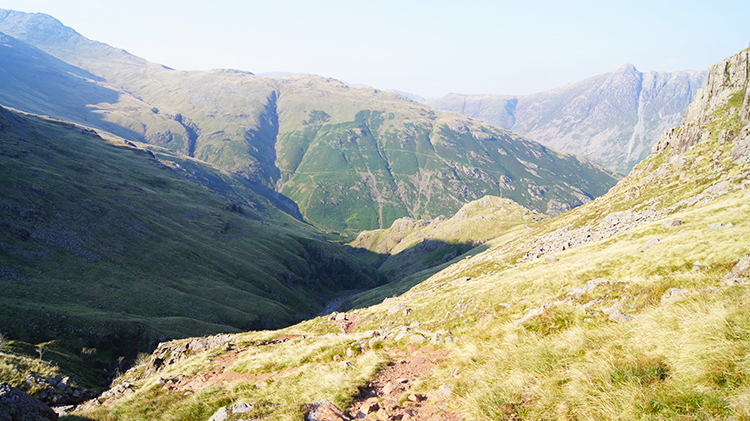 The first part was a return route off Pike of Blisco to Red Tarn. From the tarn I cut off north heading on the path leading parallel to Browney Gill and down into Oxendale. Though I wanted to get down as quickly as I possibly could as I still had a drive home to North Yorkshire I took it quite easily. I find descending as hard and as strenuous as ascending and with pace there is added risk. Many a time I have slipped on my backside, a very ungracious sight. As for twisting my knee, in the past I had suffered that on descents too. This time while walking down I met a chap hobbling in agony. "You look in pain" I said. "Yes, I twisted my knee coming down here" he replied. "Ouch, I have done that myself in the past, no fun at all" I said and added Anyway I can help". He said "Just tell my two mates down there that I'll be there eventually and to get the beer in". Past Browney Gill waterfall, over the tip of Brown Howe and down into Oxendale I went to finish the descent safely. It had been a long one, all of 350 metres downhill over a mile and I was glad to get to the bottom of it when I reached Oxendale Beck. Near the footbridge over the boulder riddled beck I met up with the stricken walkers two pals. They were waiting for him. I continued on through Oxendale to the farm at Stool End which sits in isolation at the heads of Oxendale and Mickleden and with the most engaging views of the Langdale Pikes and Crinkle Crags. Bleak in winter, beautiful in summer. I could handle it. And then I walked in to end a stunning walk. Neil and John were right, I did love the Climbers Traverse. Then again I loved everything that came after it too including the Great Slab, Crinkle Crags, the wet wilderness, Cold Pike, Pike of Blisco and that challenging descent. A brilliant day.